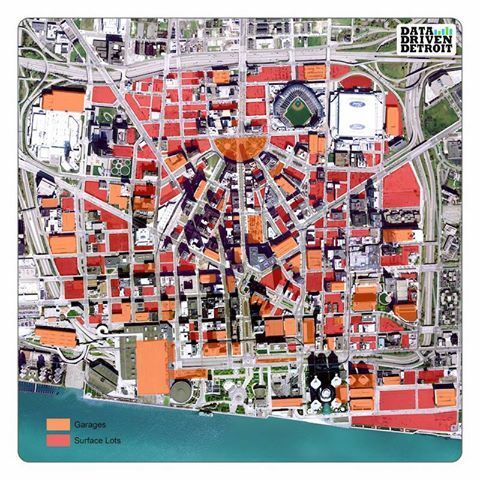 This parking map of downtown Detroit has been making the rounds, following news of the city’s bankruptcy. It’s a striking image: Close to 40 percent of downtown Detroit’s develop-able land is parking, local experts say. We thought it would be interesting to contrast it with a city that has a similar history to Detroit but is currently performing much better economically: Pittsburgh. Despite its rust belt history, Pittsburgh has a very progressive parking policy. Image: Data Driven Detroit. Orange shows garage parking, red shows surface. Now Pittsburgh: buildings in brown, garages in red and blue and surface lots in grey. Policies enacted by Pittsburgh have helped discourage solo car commuting. The city issues a 40 percent tax on parking throughout the city. It’s the highest tax of its kind in the country, and at one time it was an even higher 50 percent. In 2006, the Pittsburgh City Paper reported the city was generating about $44.5 million a year from parking taxes — more than it was making from taxing resident income. Linn said he thinks the preponderance of parking in downtown Detroit isn’t so much a result of parking regulation, but the way the city taxes land. The way commuters get to downtown Detroit and downtown Pittsburgh offers a pretty stark contrast as well. Clearly, there’s also a straightforward connection between land use and commuting, although its debatable whether too much parking is the cause or the effect of Detroit’s relative car dependence. Linn points to the city’s pitiful transit system as a contributing factor to the parking problem. Factor in freeways and auto lanes, and it is clear that Detroit is literally >75% owned by the auto industry.
? I grew up in Pittsburgh, when its pollution was so bad it was a national punchline. Everyone pointed at the steel industry, but then the parking lot attendants went on strike and nobody could commute downtown. It was the first time I remember the weather reports mentioning acceptable air quality. How much of this a result rather than a cause of a better-performing local economy? Pittsburgh, unlike Detroit had its “eds and meds” to fall back on after it lost its major industry (steel). Detroit had the auto industry and nothing else. Pittsburgh’s middle-class exodus was also not nearly as pronounced as Detroit’s and land values never plummeted as low, especially in downtown. Geography is a factor as well. Downtown Pittsburgh is surrounded by water on two sides and a steep hill on the 3rd. Detroit is pretty much perfectly flat by comparison and has no natural barriers besides the Detroit river (compare this to say, Seattle vs. Houston — hilly and surrounded by water vs. flat and not surrounded by water). Downtown Detroit suffered from more divestment and “urban renewal” than did downtown Pittsburgh leading to having much more room for surface parking lots. Detroit had the auto industry and nothing else largely because it destroyed its downtown area (which tends to concentrate high-skilled industries) by building freeways through it and parking lots for the people using these freeways. They destroyed the main advantage of downtowns vs industrial/job parks in suburbs: better interconnectivity and the ability to create strong nodes in certain industries. The concentration of jobs and offices creates a lot of opportunities for an economy. When Pittsburgh suffered from the collapse of the steel industry, the municipal authorities used tax policies to make sure that the downtown area wouldn’t be divested and to favor investments (tax land, not property, to force owners of vacant lots or unused buildings to sell rather than speculate). Detroit on the other hand kept building highways and parking lots, which are a very inefficient use of space in urban areas and which destroyed the job density required to fuel economic growth. OK, now you’ve hit a nerve. Having grown up in the Detroit area being part of a family that regularly went to downtown Detroit for entertainment and family time, much to the horror of our friends/neighbors, most of those red lots on the Detroit map had buildings on them when I left the area in 1984. Its not as if Detroit officials said, “Hey, let’s knock down these vital, fully occupied buildings (they were vacant and dangerous) so we can build parking lots all over the place.” When no one wanted to locate a business in Detroit during the previous 25 years, private entrepreneurs (esp recent Slavic & Middle Eastern immigrants) used some of those newly vacant lots by purchasing or renting them and running them as parking lots. What anti-parking folks don’t seem to have found in your research is that Detroit’s elected and top bureaucrats siphoned off millions of dollars from taxpayers/vendors over many, many decades. Bleeding the City of its revenues, sky high tax rates to partially compensate for the bled revenues, lack of constituent representation due to the absence of wards/districts, and the fat/lazy/happy/rich approach to automotive design and manufacturing in the 1970s & 1980s by the Big 4 (AMC was later absorbed by GM) are the factors which lead to Detroit’s downfall. Further, the Detroit metro area’s public transit org, SEMCOG and Wayne County were also plagued by resource siphoning by its elected officials and top staff. Making things worse, starting with Henry Ford’s $5/day scheme for unskilled assembly line jobs, Detroit became the destination for hundreds of thousands of uneducated people (black and white) from the South & foreign lands (including my grandfather) who came to Detroit to make a good living without the need for any training or education. Not surprisingly, many of the children/grandchildren/great-grandchildren of those uneducated folks believed there was absolutely no reason to spend money on a college education when they could earn $35/hr screwing on bolts at “Ford’s, GM, or Chrysler’s.” When the bottom dropped out of the US car manufacturing in the late 1970s and early 1980s, tens of thousands of former assembly line workers found themselves with few job opportunities since they lacked skills and education. They scrambled to get even low paying jobs as grocery store cashiers, Kmart shelf stockers, or waiting tables. solutions – not blaming the imploding of America’s formerly wealthiest city on too much parking. Actually, Pittsburgh lost about half of its population during its downtown exodus, same as Detroit. The big difference is that Pittsburgh diversified and didn’t rely solely on industry to get the job done. Yes, “Eds and Meds” were our fallback, but there’s so much else going on in Pittsburgh economically that it’s difficult to justify saying it was UPMC and CMU that pulled Pittsburgh out of the fire. There’s also the fact that Pittsburgh has always been a very walkable city – public transit has long been a part of the city’s DNA, though out T-transit (rail cars) could definitely be expanded outside of the South Hills and downtown areas. Detroit, on the other hand, had it’s fair share of race riots and white flight in the early 40’s and again in the 60’s. Detroit has never had a reliable public transportation system, as the auto industry subsidized a lot of the city’s development. When it comes to parking, it’s ALWAYS been tough to find in Pittsburgh. There was never a time where parking downtown was easy to do, which lead a lot of people to take the T or a bus to commute. Not to mention, our rush hour traffic is some of the worst in the nation – and it’s getting worse as population increases due to Buzzfeed lists about how Pittsburgh is the greatest city ever. Not that I’m disagreeing, but let’s keep it on the DL, please? We don’t want Fred Armisen creating a TV series about us, too. A few quick notes on Pittsburgh. 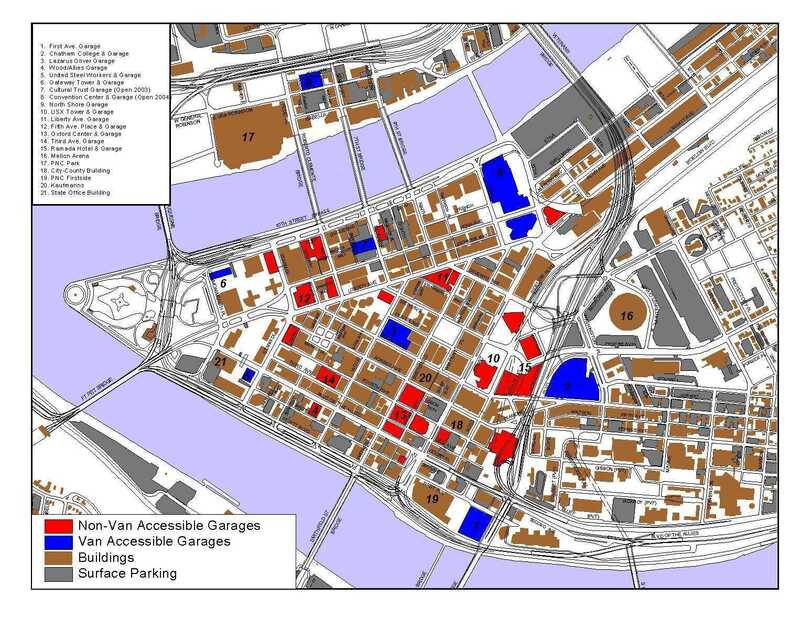 Many of the garages on the map are part of mixed-use buildings (for example, the red triangle northeast of the number 10 is the parking garage under the USX building, the largest office tower in Pittsburgh). A lot of the the surface lots on the map are in the process of being redeveloped. There are also new garages being built (either as part of mixed-use buildings or as part of new mixed-use developments), but all that should still be a big net win for density and walkability. I agree there is a chicken-and-egg problem here. Even more than Eds and Meds, jobs growth in Pittsburgh has recently been led by Professional and Business Services and Financial Activities. That’s driven down Class A Office vacancies Downtown, and also made it easier to finance Class B/C to residential conversions. So there is likely causation going both ways. Circa 1945, this was the Detroit streetcar network https://maps.google.com/maps/ms?ie=UTF8&oe=UTF8&msa=0&msid=203728989602421142072.0004874dddc1d1e99088f . They had a comprehensive public transport system, but like many other cities they destroyed it between 1945 and 1960. I remember Pittsburgh in the last 90s and Fifth Avenue was a ghost town and there were still “adult” joints on Liberty. The Collapse of the Steel Industry devastated this city. Pittsburgh managed to hang in there with empty buildings and has been revitalized by the eds and meds, but really you can’t forget the Natural Gas industry. Also, the fact that people realized they can ‘live’ downtown. Most of those buildings that were offices are now being used for places to live. Downtown has a 96% occupancy rate – the highest in the country. It also helps that although downtown got a bit sketchy, it never was dangerous. Sorry Detroit, my brother lived in Center City and it was not the safest place. The map of Pittsburgh is at least 11 years old. The only solution is to stop being a “company town” and kill the “car culture”, which you have rightly pegged as the original sin of Detroit. It’s a curious original sin. Back in the beginning of the 20th century, GM, and Ford both made buses, and before that, they made railcars and streetcars — the obssession with roads had not taken over yet. But at some point they decided to go all in on cars, and that spelled doom. I still don’t know why they did that. Detroit made special efforts to actively destroy their public transportation, and was one of the key locations of the GM/Firestone/Standard Oil streetcar destruction conspiracy. Being a company town was bad for Detroit. When the auto industry decided to destroy streetcars, they destroyed the city along with the streetcars. Pittsburgh lost many of its streetcars, but some of them survived (and are now the T). Why do the Pgh and Det columns in the “Mode” table each add up to less than 90%? Is there a carpool mode that’s missing, perhaps? It’s actually the parking, sorry. Arguments about local culture are nonsense. It’s a policy decision that we don’t have a transit system anymore. I don’t think they are, either. They said it is both a cause and a symptom. It essentially accelerated an existing problem: parking came in, weakening the fragile area around it made so by corruption, and then those buildings had financial problems (which they probably would have had anyway), and so someone tore them down and put up parking, making it worse than ever before. Essentially, parking acted on the city kind of like smoking cigarettes does on a stressed person: sure, said person might have immediate relief, but the cigarettes actually increase overall stress, so while it might provide someone with momentary relief, it actually makes things worse for the stressed person. Likewise, parking provided the removal of buildings that were in trouble, perhaps vacant, but it weakened the rest of downtown. It wasn’t necessarily the cause of Detroit’s problems, but it worsened existing problems and their impacts, and I think that is what they are trying to get at in the article. While you have some points, I really don’t think that would have been the end of it. Why did people use cars for daily errands anyway? Did the built environment force them to do so, or was it of their own will (meaning, were there really attractive alternatives that might have been worth using)? Just because you make cars does not automatically mean you use them. By way of example, the Germans have a thriving car industry (even if there have been some scandals recently). Yet the Germans also have a fairly strong but seldom mentioned cycling culture, and really excellent public transportation. The above applies to Japan as well (although the cycle culture is sadly very weak outside of Tokyo). So… why does this matter? It suggests that the culture was influenced by other factors.